Belize NMS: Moderate to fresh easterly airflow prevailing. 24-hour forecast: Sunny with a few cloudy spells today and partly cloudy tonight with only isolated showers. General Outlook: (Thursday and Thursday Night) Fair, windy and dry weather conditions are expected. 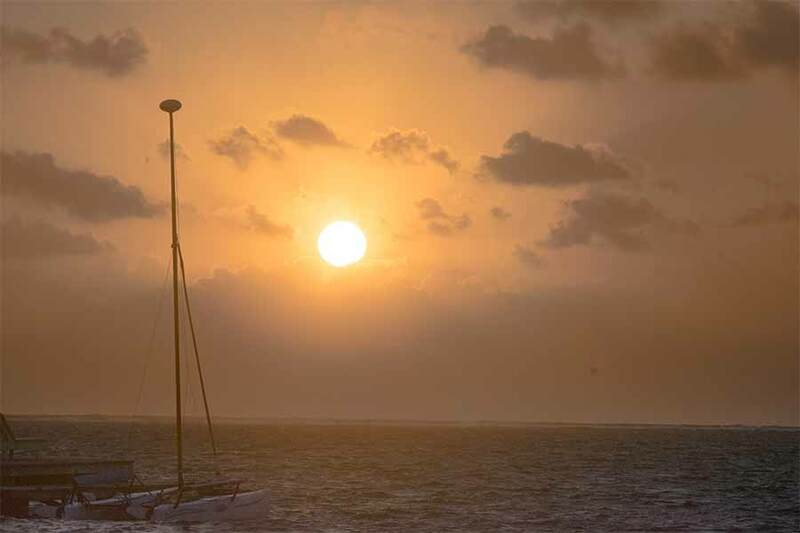 Today E-SE 10-20 kts Moderate-Rough 4-7 ft CHANCE OF ONLY ISOLATED SHOWERS. Tonight E-SE 15-25 kts Rough 5-8 ft LITTLE OR NO RAIN. Tomorrow E-SE 15-25 kts Rough 5-8 ft MAINLY DRY. Outlook E-SE 15-25 kts Rough 5-8 ft MAINLY DRY. Seismic activity with undersea volcano Kick em Jenny, north of Grenada near 12.18N 61.38W has steadily declined, and the alert level for mariners has returned to normal, with an exclusion zone of 1.5 km. Please see www.nadma.gd for additional information. 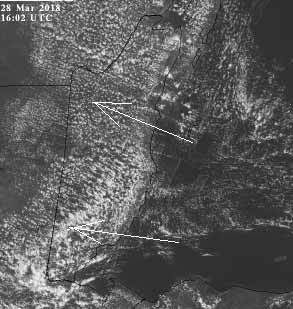 As of 28/0300 UTC the tail end of a cold front enters E Cuba near 21N75W and extends to central Cuba near 22N80W. The front is void of precipitation. A band of scattered showers are over the Virgin Islands and the northern Leeward Islands from 17N-20N between 61W-63W, moving E.
The base of an upper level trough is over the central and eastern Caribbean Sea with axis along 65W. 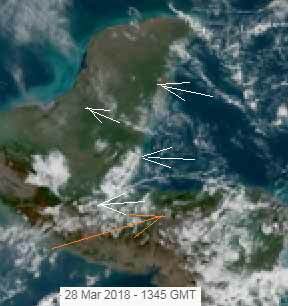 Strong subsidence is over the central Caribbean. High pressure in the SW N Atlantic Ocean will support fresh to strong trade winds in the south central Caribbean Sea through Saturday. The winds will pulse to near-gale force along the NW coast of Colombia each night through Friday morning. A gale is presently in effect until 28/1200 UTC. Large N to NE swells will propagate into NE Caribbean Sea passages from Tuesday night through Friday morning. On Ambergris Caye this morning the wind is blowing from the East at 20 mph. making the sea rough around the Barrier Reef. We have an Advisory: *Small craft caution for gusty winds and occasionally rough seas.* . 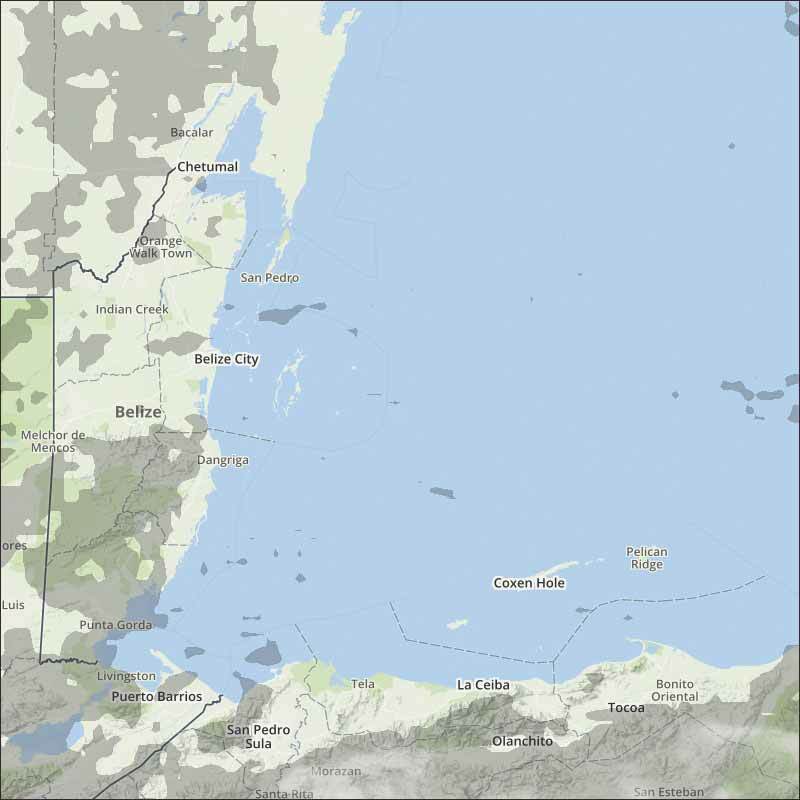 It's March and this is March weather.Today's expected high is 86 f.
The Caribbean winds are still from the east, and producing significant cloud over southern Belize and in parts of northern Belize, although a few rain showers last night, none showing up this morning. Looks like today will be mainly sunny, with increasing cloud this morning, then decreasing this afternoon.